Well, most of the time, you can see kitchens in white. But others think that this is boring. If you think the same way, then it is time for you try a different twist for your kitchen. Nope. It doesn’t have to be bold and too colorful. You can just choose another color that you can pair with white. Apparently, white goes well with anything and with any color. But would it look good with gray, which is a mere combination of black and white? Gray has more white than black. Its amount of white actually determines the kind of shade gray will get. If you want a lighter gray, add more white. If you prefer dark gray, then add lesser white. However, if you opt to combine gray with white, both light gray and dark gray will look good. And yes, it will also look great if you use black and gray together. Why are we talking about this, anyway? 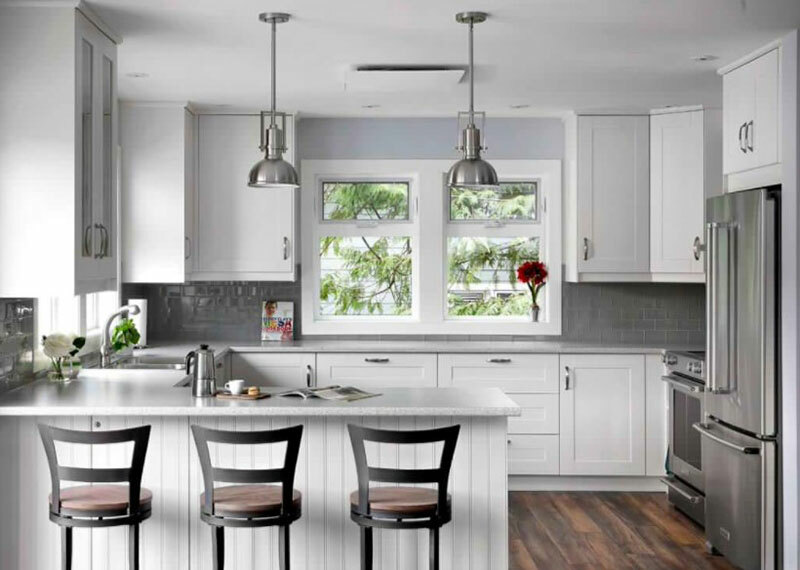 Well, today, we gathered some kitchen designs that used white and gray in it. For sure some of you think that this would look dull or boring. Before you conclude, why don’t you scroll down and take a look at the kitchen interiors below. You might change your mind! 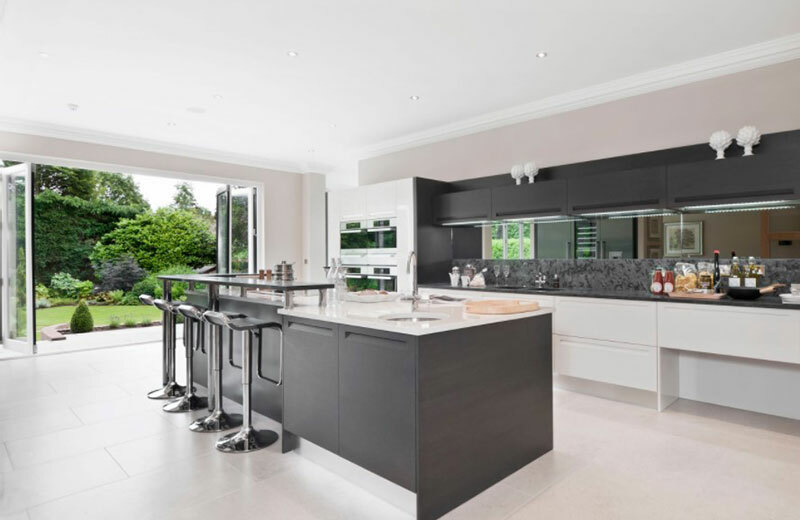 A large transitional L-shaped kitchen with dark wood flooring. 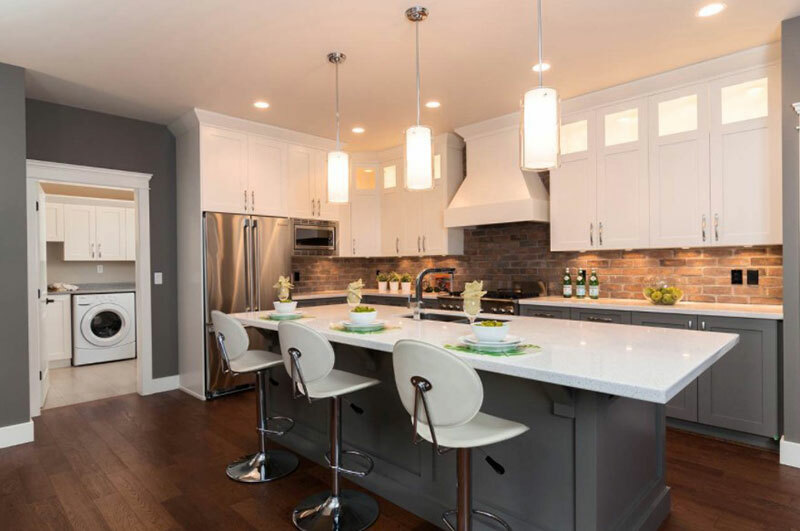 The shaker cabinets bring that transitional vibe into the space. Hardwood remains the most popular floor choice for kitchens just like this one. 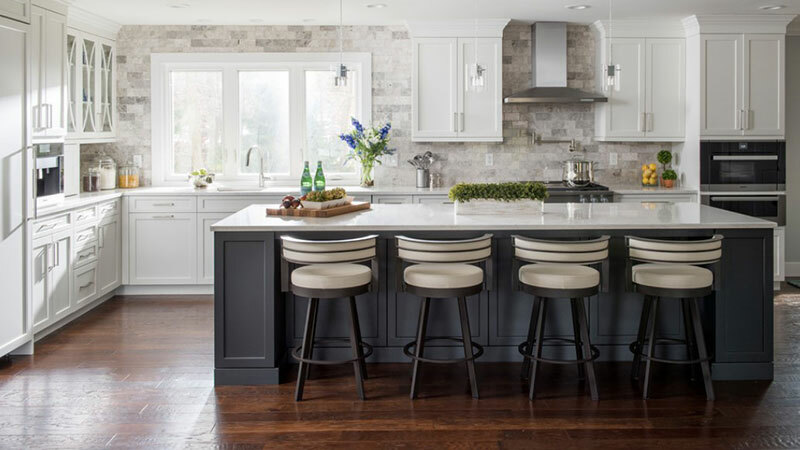 It looks great with the white shaker cabinets and the dark gray color of the island. Read how to clean hardwood floors so its quality and beauty will be retained for years. The multicolored mosaic tile backsplash compliments with the stainless steel appliances and the granite countertops in this kitchen. For sure, you will also love the cute pendant lights! Warm grey-pink cabinets are used in this kitchen. It is warmed up by using warm-toned hardwood floors and decorative accessories. That vintage bench looks really fabulous! 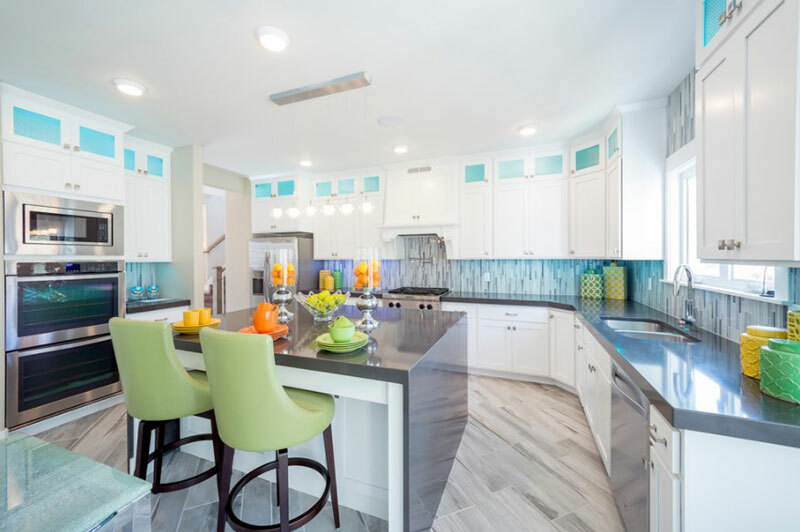 This U-shaped kitchen has ceramic flooring and colored glass for its shaker cabinets that add some fun vibe to the space. This is the result of a kitchen renovation wherein the designers added a steel ledge above the cabinetry for decorative reasons. It looks beautiful although most of the items here are gray. 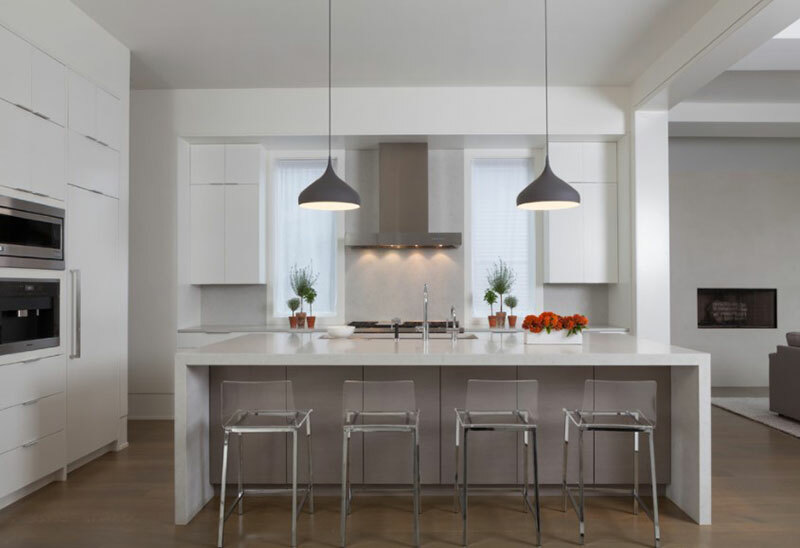 An L-shaped contemporary kitchen with a combination of white and gray for its flat-panel cabinets, white cabinets. It is nice that the kitchen has a colorful wall decor to add more life to it. Seen here is a modern kitchen with a double-bowl sink. Some of its cabinets are white while the others are gray. It is nice that the designers opted to use glossy finish for a sophisticated appeal. 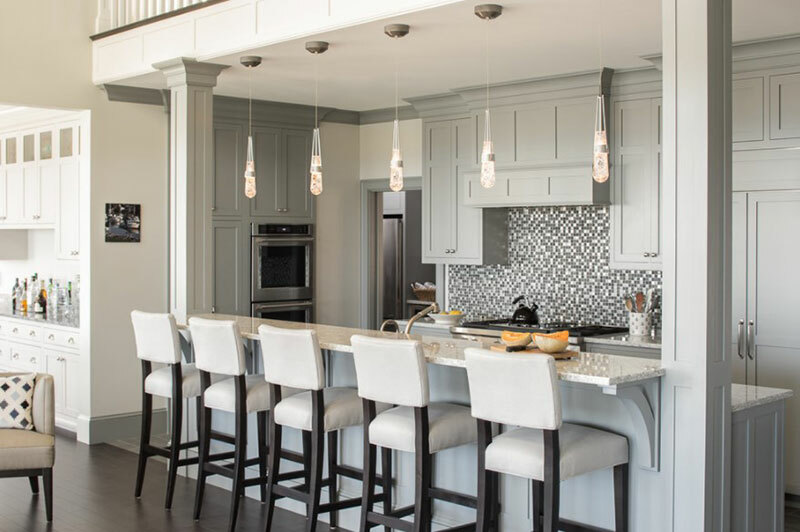 Gray glass subway tiles are used for the backsplash of this kitchen while the shaker cabinets are white. The curved-edge laminate countertop gives this space a retro feel. 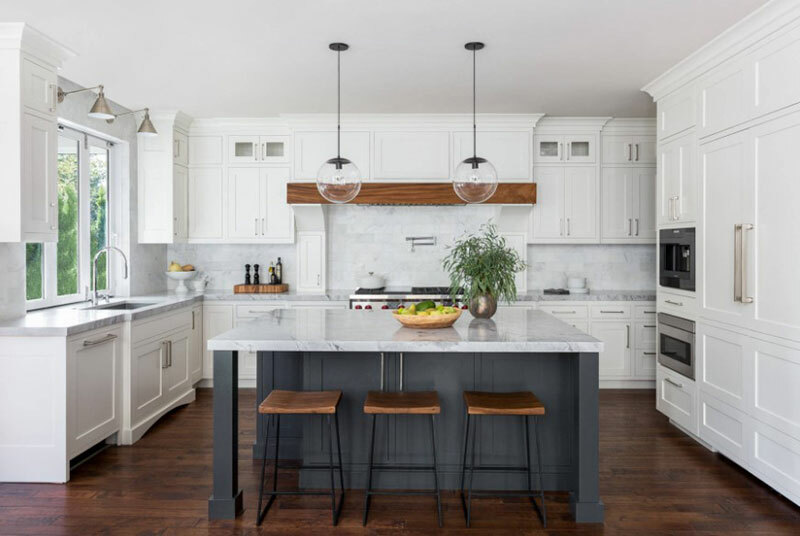 This kitchen has white recessed-panel cabinets and gray marble backsplash. Even though the kitchen is small, it looks really nice. I love that storage area with a wooden sliding door with a chalkboard. It is a nice spot to showcase one’s drawing and lettering skills. Of course, you can also use that to list down items that you need to buy from the grocery. 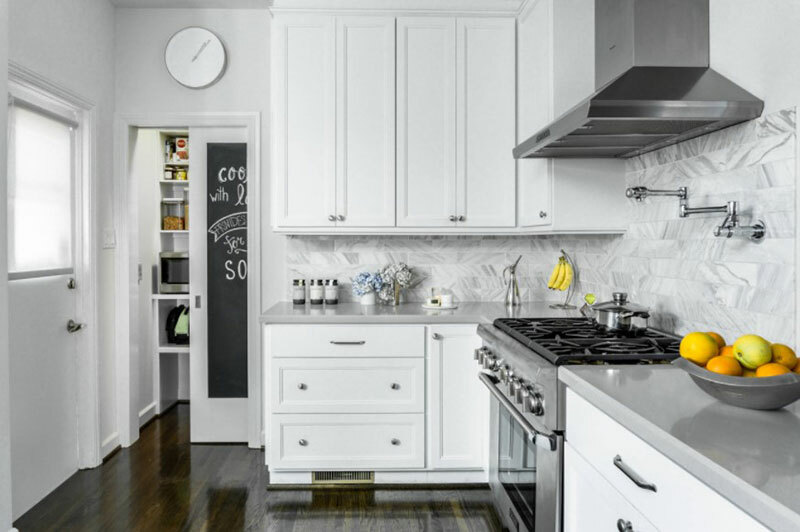 A small kitchen with many storage areas and white subway tiles for the backsplash. Isn’t this a nice and simple kitchen design? Dark wood flooring is used for this eat-in kitchen with shaker cabinets and quartz countertop. It is also surrounded with windows that allow the owners to get a good look of the garden while preparing meals. 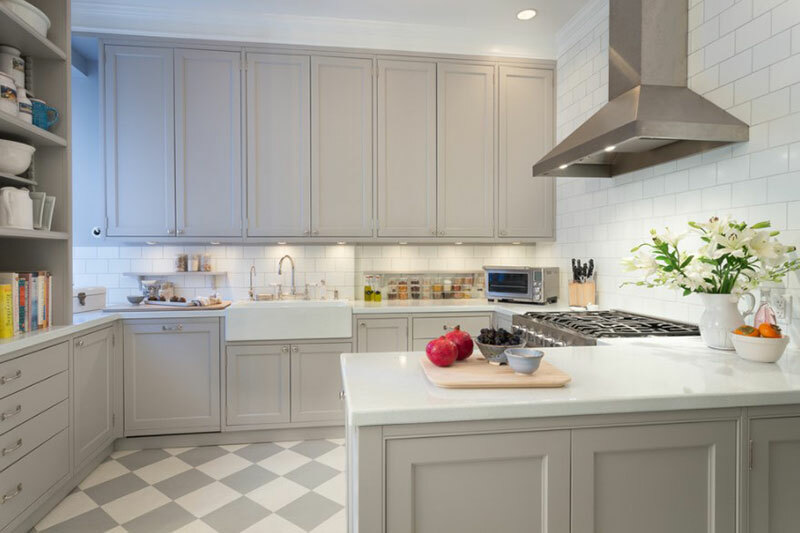 A simple modern kitchen with white cabinets and gray backsplash. It also features stainless steel appliances and fixtures which completes the look. 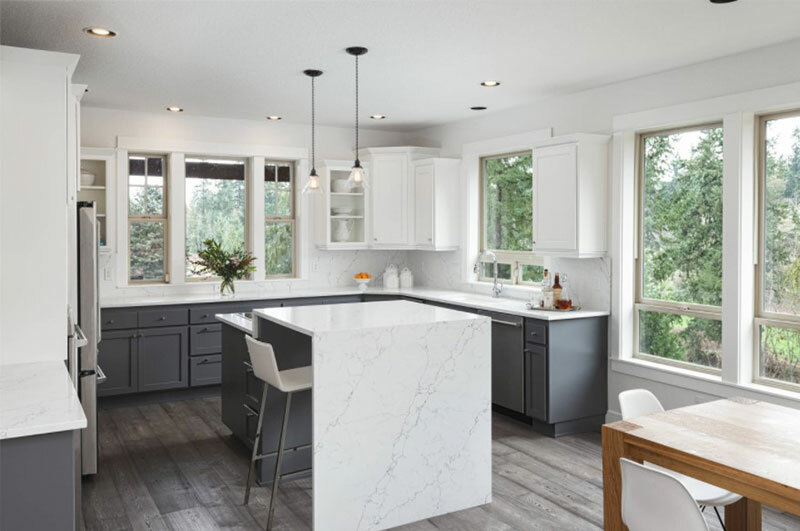 If you’re worried about gray overpowering your kitchen, a mixture of grey and white units will be a good idea like this one. 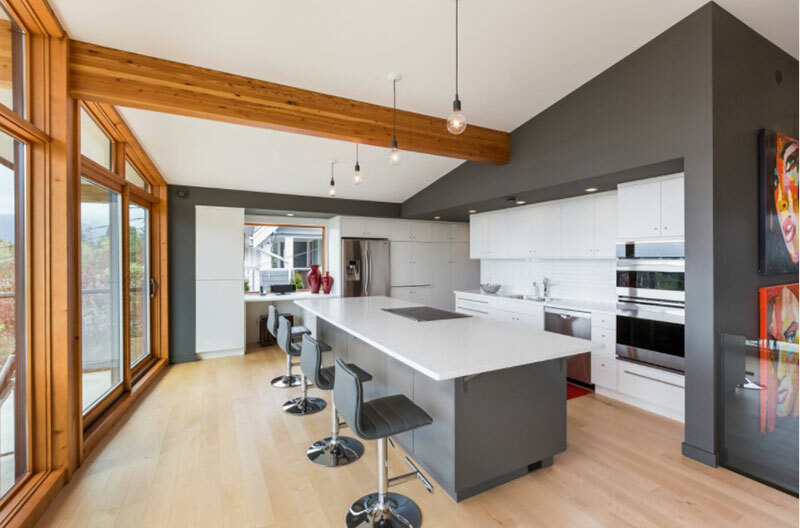 The folding glass doors connect the kitchen to the outdoor space. 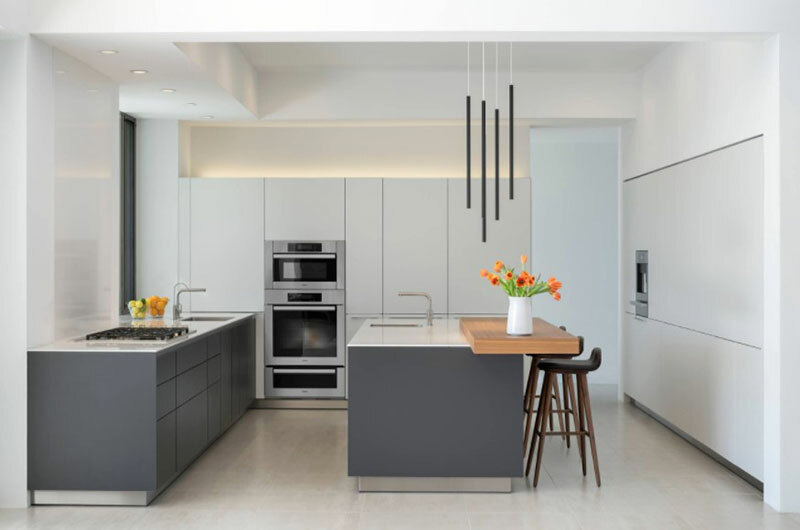 A modern gray and white kitchen with a curvy island, giving it a subtle futuristic look. The pendant lights also added appeal to it. 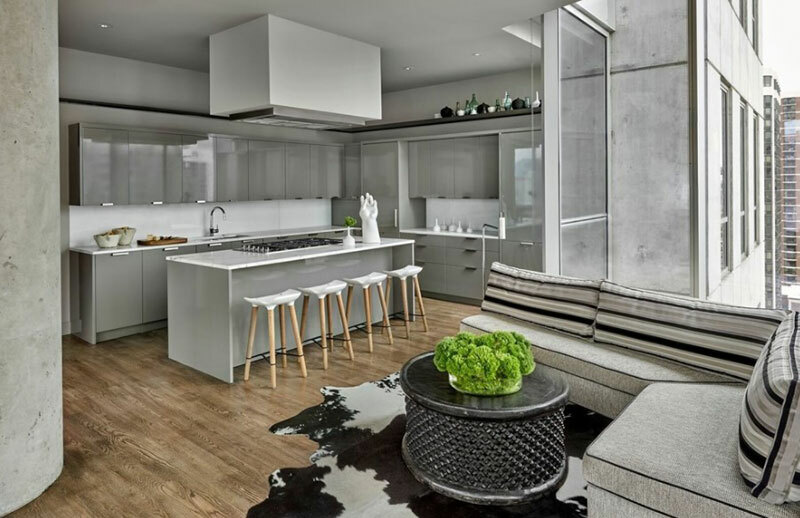 This two-tone kitchen has a lovely mix of texture and material. The textured brick backsplash bridges the gap between the blue lower cabinets and the snowy white uppers. 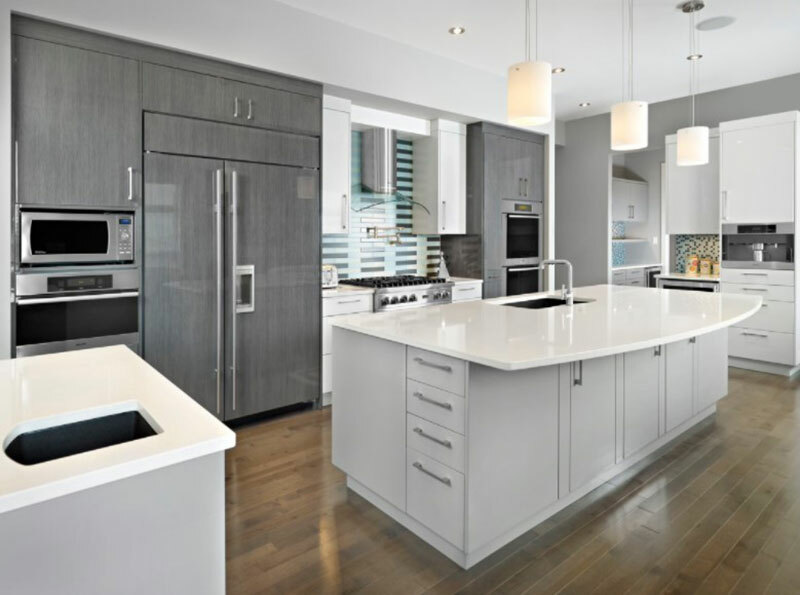 This trendy kitchen features stainless steel appliances which are a good match to the gray and white colors in it. You can also notice that it use stainless long handle pulls for the drawers. 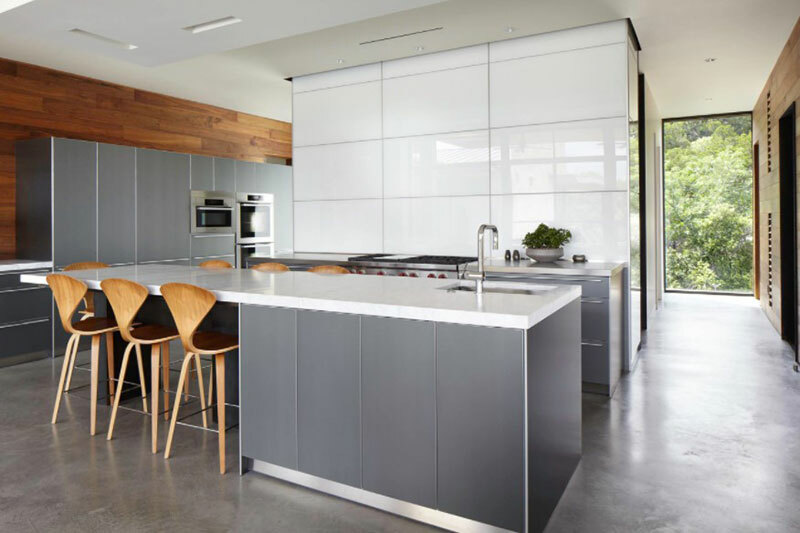 Check out other kitchen designs with stainless elements. The owners mixed warm natural finishes such as stained wood with gray tones in concrete and local limestone. This is also reflected in the kitchen with its use of gray for the island, wood for the chairs and white for some parts of the wall. 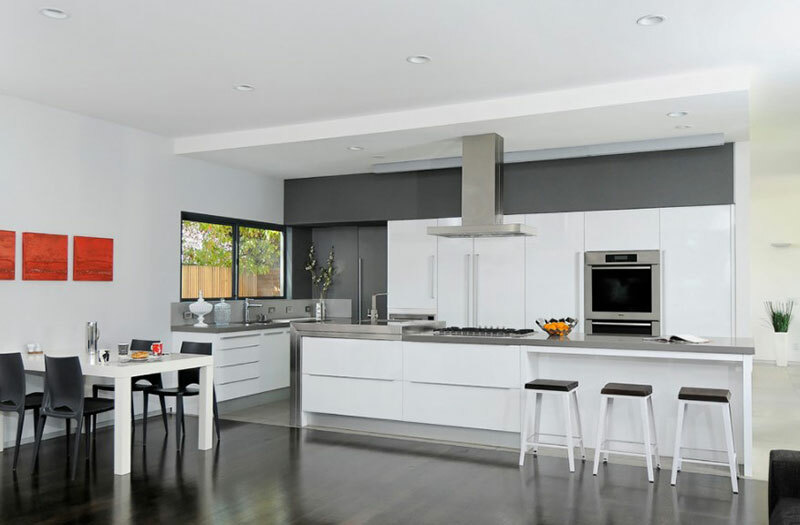 A sleek modern kitchen with white cabinets and island. It is a good idea to add a little gray color in it as a contrast. If you have enough space, you can also have a layout like this with two islands. 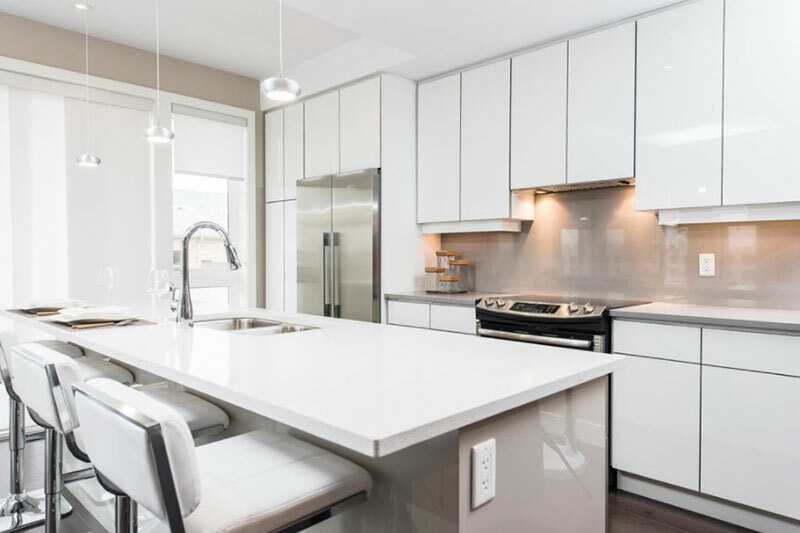 This kitchen has an under mount sink, flat-panel white cabinets, and stainless steel appliances. There are indeed many color options for the kitchen. Most of the time, one would opt for a neutral look which is actually easier to decorate. 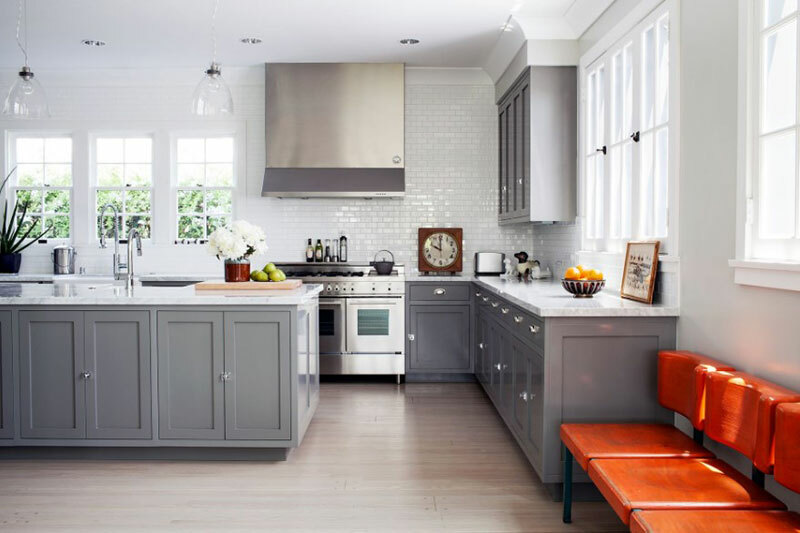 Hence, if you want to add some spice to your white kitchen, why not bring in some gray cabinets and other accents. The above images already gave you ideas on how you can use white and gray together. Now it is up to you if you would like to use this combination for your kitchen. You could also notice that adding some wooden features could alleviate the kitchen’s appeal!